Angela Cuadra, Fernando Arrocha. "On Air"
San Antonio Abad Hall. Main entrance. 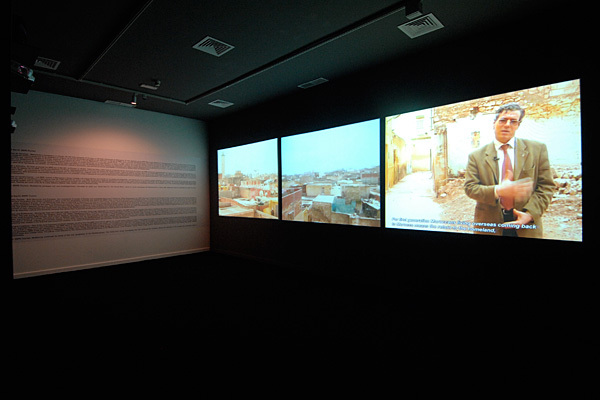 Artists: Fernando Arrocha /Ángela Cuadra, Ursula Biemann, Multiplicity, Rashid Masharawi. Organized by: Centro Atlántico de Arte Moderno. CAAM. 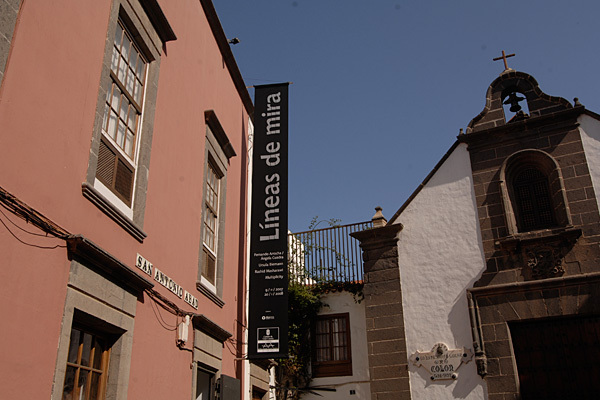 From 9th November to 20th January 2008, the Centro Atlántico de Arte Moderno (CAAM) in Las Palmas de Gran Canaria presents the Lines of sight exhibition in the San Antonio Abad exhibition hall, curated by Amparo Lozano. Through four projects, this exhibit aims to analyse how globalisation and the new communication and advertising technologies affect different aspects of the new world order. The Lines of sight exhibition is part of the San Antonio Abad-CAAM programme this season, in which it invites a curator to conceive a specific exhibition project. These exhibits present a previously unpublished thesis and analysis of contemporary art, while the CAAM produces part of the displayed work and publishes a bilingual catalogue. In the case of the Lines of sight catalogue, according to the curator’s express wishes, it will be published after the exhibition opens in order to include pictures of "On air" 2007, by Fernando Arrocha/ Ángela Cuadra, specially produced by CAAM The catalogue will also include pictures of the assembly and installation of the pieces in the San Antonio Abad exhibition rooms. Through four projects, the Lines of sight exhibit aims to analyse how globalisation and the new communication and advertising technologies affect different aspects of the new world order. The impact of these asymmetrical relations on knowledge and understanding of the general dynamics of contemporary life leads to a reflection on which narrative and representational strategies – from an artistic perspective – could be the best comprehensive tools to increase the visibility of certain situations and different worlds of experience, most of them alien to standard cultural and sociological theories. Information has become a merchandise subject to the laws of supply and demand; market criteria clearly prevail over civic or ethical factors. Costly remote controlled research aims at optimising the efficacy of planned communications, focusing on the Baudrillardian prophecy according to which we live in a world in which the highest function of the sign is to make reality disappear while disguising the fact of its disappearance. 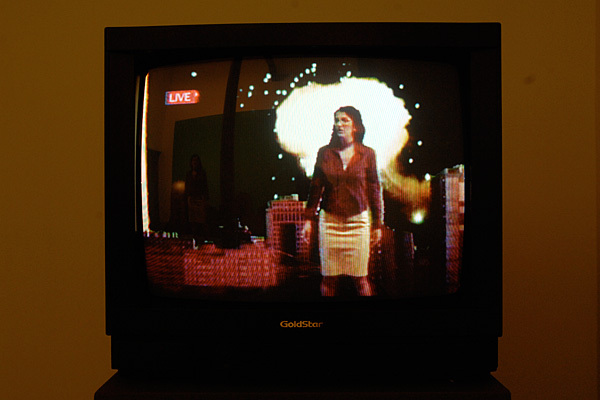 Fernando Arrocha and Ángela Cuadra present ON AIR, a project produced by CAAM and specially made for this exhibition, which emphasises the falsity of media images and the promiscuity of TV images using one of its most common forms of persuasion: live broadcasts, "real time" pictures. The spectator has the option of personally inspecting the location to find that the information broadcast on TV is no more than a set-up, or sit on a couch and contemplate the scene become sign in an aseptic domestic setting. Nothing which does not appear in the ever-present media exists. Mediatised by the ideological and symbolic power of the mass media, contemporary societies blindly accept their postulates, without being truly aware that their real intentions largely lie not in what appears in them (under disguise) but what they ignore and hide. A self-taught film maker, Rashid Masharawi grew up in the Shatila camp, on the Gaza strip. The "Live from Palestine" (En direct de Palestine) documentary is about the day-to-day problems facing a radio station, The voice of Palestine. Indeed, the camera records the destruction of its offices as they were burned and silenced by the Israeli occupying forces. At the end of the last century, the way of thinking encouraged by power in relation to globalisation not only focused on the unification potential of the new forms of communicational interconnection, but also on economic and technological interconnection strategies. Disorder grows on a daily basis with the multitude of migrants fleeing from impoverished countries, subordinated to the "world order" imposed by neoliberalism. Multiplicity is a territorial investigation agency headquartered in Milan, comprising professionals from different creative disciplines. With (M)RE-Tourism, it is continuing the investigation it started in 2002 about how the new nature of the Mediterranean influences the identity of those who cross it. The different generations of MREs or Moroccans residing abroad (Marocains Résidents à l’Étranger), have similarities and differences in their interests. 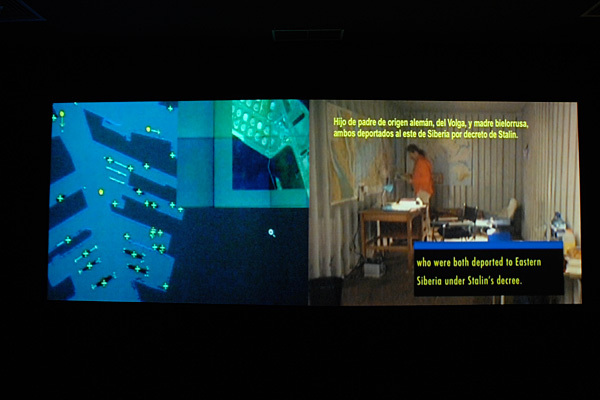 In this context of a world of high-speed financial exchange and communications, some authors –as Blanca Muñoz points out– believe that the end of the 20th century and the beginning of the 21st have been marked by a terrible dualisation: ideological over-alienation in the First and Second Worlds and economic over-exploitation in the Third. In an attempt to provide a broad perspective and different approaches to the present, the Contained Mobility project, by Ursula Biemann, tells us about Anatol Zimmermann, "a new post-national subject, a subject not affected by political representation". Through his experience, it questions the contemporary concept of citizenship, narrating the terrible case of "non-belonging" while questioning whether intervention in social injustice is morally more justified that its aesthetic representation. ** The catalogue – besides a description of the projects and a text by the curator – includes an unpublished essay by Jorge Luís Marzo: Art, objectivity and commitment.